Vanuatu signed and ratified the United Nations Convention on Biological Diversity (UNCBD) joining other 190 CBD parties to protect our global biodiversity. Vanuatu’s first National Biodiversity Strategy and Action Plan (NBSAP) was developed and endorsed in November 1999. Revision of this NBSAP has led Vanuatu to develop this new NBSAP (2018-2030). This revised NBSAP indicates the progress, successes and gaps that lie within the organisational, systemic and individual capacities at national, provincial and community levels to protect, conserve and wisely use our biodiversity. The NBSAP (2018-2030) has seven strategic areas with country indicators and targets towards achieving the Global Strategic Programme of 2020 Aichi targets. The new NBSAP includes the views of the national and provincial government, non government organisations (NGOs), community based organisations (CBOs) and local communities, which are indicated in seven strategic areas. These are: 1. Conservation Area Management 2. Forest and Inland Waters Ecosystems Conservation and Management 3. Coastal and Marine Ecosystems Conservation and Management 4. Species and Genetic Diversity Conservation 5. Invasive Species Eradication and Control 6. Mainstreaming Biodiversity across sectors and society 7. 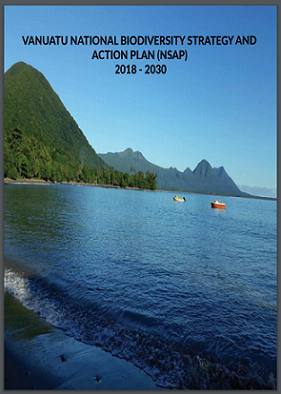 Resource Mobilisation The strategy and action plan also includes the provincial implementation plans, which outline specific local actions to address threats affecting the islands’ biodiversity, including identifying potential conservation areas. This create the avenue for local communities to actively participate in implementing the NBSAP.